The “Daughter of Disco” who launched her multi-faceted career co-writing with the legendary Nile Rodgers, Christine Gordon is gearing up to conquer the dance floor once again with the drop of “Tidal Wave” – an infectious, crazy powerful track that’s primed to become a premier inspirational anthem of our time, helping to lift our spirits above the endless din of division and negativity our world seems to be drowning in of late. This track is just the beginning of a rollout of explosive singles for the artist, who will follow “Tidal Wave” with the romantic and sensual, mid-tempo summer song “Refill,” a co-write with mega-producer Mark Batson (Alicia Keys, LeAnn Rimes, Beyonce, Sting) that is set to be remixed by Dave Aude (Katy Perry, Lady Gaga, Selena Gomez). A true force of musical nature, a conversation with Christine will inevitably leave you blown away by her refreshing, exuberant energy. A freewheeling whirlwind of passion, energy, and soul-deep artistic vision who transcends genre limitations and the trends of the moment, Christine Gordon has just about done and been it all. She’s studied opera, sung jazz at NYC’s Blue Note and R&B in Harlem at the Apollo, and even held court for over a decade in the French West Indies (hence her nickname “StBarthRockStar”). She’s headlined festivals all over the Caribbean and France/Europe, opening for greats like Akon, Shaggy and Kool and the Gang. Never one to be kept in a box, the multi-talented singer-songwriter has long defined her own self-styled genre as “Classical Pop Rock Neo-Classic Soul Jazz,” is even affectionately also known as “The Lioness” for the bold, fearless and incredibly powerful way she dominates the stage. “Tidal Wave” is more than the first venture in the next phase of Christine’s career – it’s a fresh calling on her life. “I truly felt compelled at a certain point, to leave paradise, and the incredibly successful career and business I had built there, and return home to the states. It just seemed that it was “TIME” …after such a long, fruitful stay in the Caribbean, to bring all my positive energy home, and to use my voice to spread love and positivity …and messages of peace. I wanted to be back in Los Angeles where I could link up and collaborate with top producers of today, and hopefully create songs like the song ‘Just One World’ I wrote with Nile back in the day…. and to use my creative voice as a songwriter to continue to create powerful positive message music in opposition to the hate and negativity that is trying to make us all feel so alone and lost these days. The singer wrote the original version of “Tidal Wave” with Alex “Cobra” Piper, a member of the legendary St. Maarten based Afro-Caribbean band Youth Waves that Christine sang lead vocals with for over ten years. After Hurricane Irma nearly destroyed the island, “Tidal Wave” took on an even deeper significance. 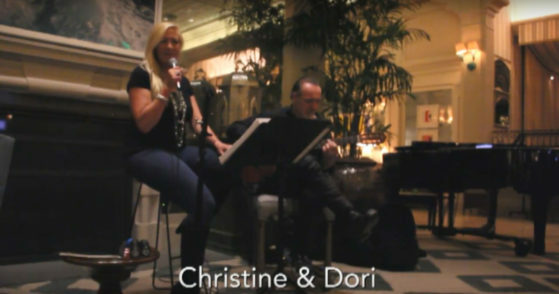 Christine launched her songwriting career in the 90s, learning her trade from and collaborating with Rodgers, Reggie Griffin (Chaka Khan, Toni Braxton, Isley Brothers, SWV), David Lasley (Anita Baker, Whitney Houston, Luther Vandross) and Jeff Franzel (Whitney, Taylor Dayne), producing Christine’s solo debut album The Worth of My Soul. After writing “Just One World” with Nile Rodgers, Christine was offered a publishing deal, and she moved to Los Angeles and continued writing songs full time through her early 20’s, while feeding her obsession with live music by performing coast to coast. Her later discography includes Youthwaves ft. Christine VOICES, Christine LIVE, Lost Love Songs, Any Day Now, and her Christmas album The Greatest Gift.